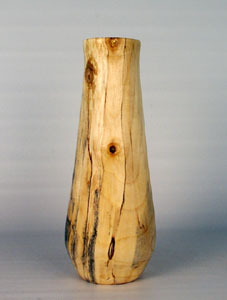 This vase is a piece of red maple that the hydro was cutting and a friend picked some up. At our Kingston Woodturners meeting he brought it for the 50/50 draw and I was lucky enough to win it. It is 9″ tall and about 3″ at the bottom, the wall thickness is 1/8″ for most of the length. The bottom has been left a little thicker to give it some weight and staiblity.